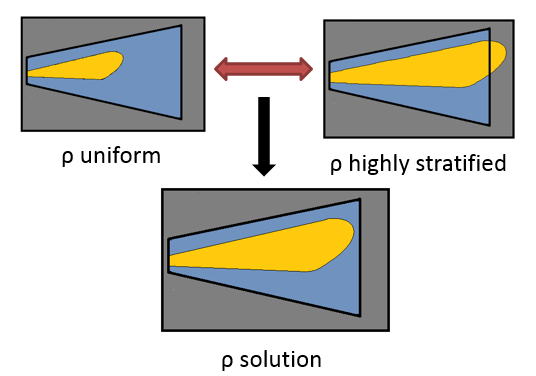 A high current conical 11C gas target with a well characterized production yield was designed and optimized using multi-physics coupling simulations. Two target prototypes were deployed on an IBA 18/9 cyclotron, and the experimental results were used to benchmark the predictive simulations. Target design constraints included a gas volume less than 80 cm3, based on existing commercial designs, and an operating pressure less than 50 bar (725 psi). The target operating pressure constraint corresponds to a maximum target pre-pressure of roughly 14 bar (200 psi). The main objective was to maximize saturation yield without exceeding the volume and pressure constraints. Due to the 3.22 MeV threshold energy for the 14N(p,α)11C reaction, the ideal target geometry is not range-thick to protons. Less than 2% of the yield is produced by protons between 0-6 MeV, although they account for one third of the heat input to the target. To maintain a reasonable target volume, protons of reduced energy (that no longer have significant cross-section) stream out of the radial and back walls of the target chamber. Effective target depth can be increased by raising the operating pressure of the nitrogen gas, thus increasing the target mass and stopping power. However, maximum operating pressure is limited by the failure point of the target window. Two conical target designs were simulated, and four total configurations were fabricated and experimentally tested. For each design, a smooth wall and rough wall target were constructed. For the rough wall cases, the Roughness Average (Ra) was increased from roughly 3 μm (for the smooth wall targets) to more than 100 μm. 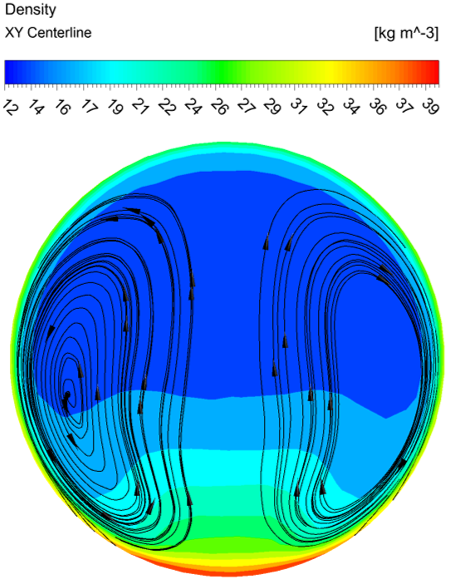 The multi-physics modeling technique includes explicit coupling of radiation transport and associated stopping power/heat deposition (MCNPX) to computational fluid dynamics (CFD) modeling of the gas density profile and resulting convective currents (ANSYS Fluent). Information is passed between the radiation transport and CFD codes in an iterative fashion until a converged density profile is achieved. Each iteration approaches the final solution in an oscillatory manner due to the tight coupling between target density profile and stopping power/beam heating. 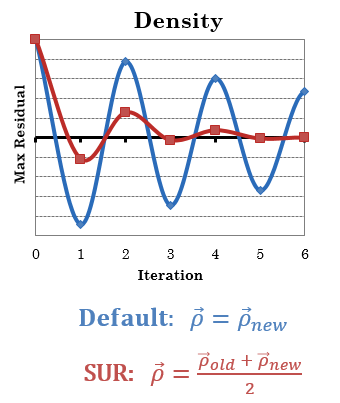 The convergence rate can be increased by roughly a factor of two by using successive under-relaxation (SUR) of the density profile supplied to MCNPX, while maintaining an equivalent converged solution. Each iteration approaches the final solution in an oscillatory manner due to the tight coupling between target density profile and stopping power/beam heating. 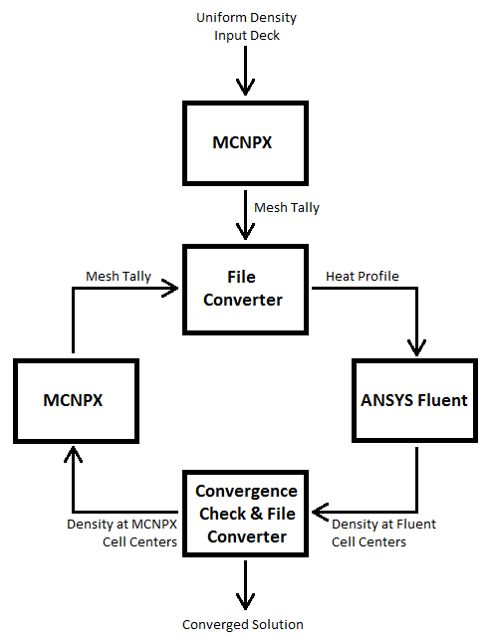 The convergence rate can be increased by roughly a factor of two by using successive under-relaxation (SUR) of the density profile supplied to MCNPX, while maintaining an equivalent converged solution. The converged solution is used to generate a three-dimensional distribution of reaction rate in the target. This both accurately predicts the total product yield and provides insight for geometry optimization. The dimensions of the conical gas chamber were optimized with respect to the yield distribution in such a way that regions with significant contributions to yield were included, while regions with small yield contributions were excluded to maintain a reasonable system volume. An experimental benchmark was performed using smooth wall Prototype 1 for four experimental cases. Two simulation constraints were selected to benchmark C-11 saturation yield for the model and experiment, nitrogen mass and transmitted energy spectrum. By adjusting the material properties table in ANSYS Fluent, it is possible to align the simulation to one of the two constraints, but not both. Nitrogen mass is a function of known initial temperature and pre-pressure. To measure the transmitted energy spectrum, two copper foils of 25 μm thickness were stacked in the back of the target chamber. 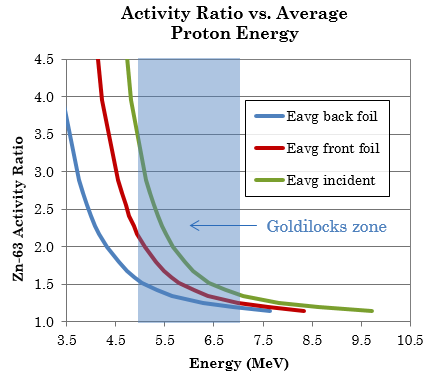 The ratio of Zn-63 activity produced in each copper foil can be used to estimate the average energy of protons which strike the back wall of the target. The two copper foils were included in the MCNPX simulation, and the foil activation ratio was used as an additional benchmark constraint. The transmitted energy range that produces a useful ratio, roughly 4.5 to 6.5 MeV, corresponds well with the reaction threshold. 11C activity was measured using a combination of (see figure below) soda lime(1), molecular sieve(2), and gas sequestration traps(3). Approximately 90% of the 11C activity was delivered in the form of carbon dioxide. Internal gas pressure as a function of beam current was measured for Prototype 1 for three initial pressure conditions. Saturation yield measurements are compared to simulation results. The simulation predicts total saturation yield of 11C, so the plotted simulation values have been reduced to 90% to account for the recovered fraction as 11CO2 and provide a direct comparison to the experimental data. There are two simulation results for each benchmark condition, corresponding to the transmitted energy spectrum and nitrogen mass constraints. For all cases, the energy spectrum constraint predicted a 5% lower saturation yield than the mass constraint. Beam shape was measured experimentally using a paper burn at the front window plane, and later using GAF-chromic EBT-3 film. The source profile for the MCNPX input deck was adjusted to match the experimental profile. Simulation predictions of saturation yield were shown to be insensitive to a 20% increase in beam peaking factor. Nitrogen temperature along the vertical and horizontal mid-planes is shown below. Nitrogen density is strictly a function of temperature with lower density in the regions of higher temperature. Higher temperature in the top of the target is a result of convective currents in the nitrogen gas. Linear yield density, or saturation yield per unit length, illustrates the relative contribution to yield of each nitrogen region as a function of depth. This allows for optimization of the chamber dimensions, including selection of appropriate target depth. Maximum linear density occurs around 11-12 cm. High reaction rate near the radial wall at this position motivated the increased taper angle for Prototype 2. 3D yield density distributions offer similar information and insight with considerably more detail. The yield density indicates the region of the reaction threshold, with a shape consistent with published visible light images of gas targets. Experimental saturation yield for the two prototype targets was compared to the simulation predictions. Only the smooth wall prototypes were simulated due to the computational expense associated with modeling the wall roughness. For both prototypes, the simulation over-predicts 11CO2 saturation yield by approximately 10%. Prototype 2 produces a higher saturation yield than Prototype 1, which can be primarily attributed to less proton escape through the radial walls. The prototype targets were capable of producing significant amounts of 11CO2. The largest single production run produced 410 GBq (11 Ci) for a 30 minute irradiation at 120 μA using the rough wall Prototype 2. The described multi-physics modeling technique has proven to be a valuable tool for gas target design and optimization. For this application, the ideal target geometry is yield-thick, but range-thin. The simulation package was successfully benchmarked using two prototype targets. Additional benchmark experiments and model refinements are planned to improve the predictive capabilities. For additional details, please see full publication from WTTC16 here. D.B. Pelowitz, Ed., “MCNPX User’s Manual Version 2.7.0” LA-CP-11-00438, 2011. P.J. Linstrom and W.G. Mallard, Eds. : NIST Chemistry WebBook, NIST Standard Reference Database Number 69, Natl. Inst. of Standards and Tech., http://webbook.nist.gov, (retrieved April 2016). D.J. Schlyer, S.-J. Heselius, A.P. Wolf: WTTC 2 Proc., Chapter 2, pp. 12-14, 1987. S.-J. Heselius, P. Malmborg, O. Solin, B. Långström: Appl. Radiat. Isot. 38(1), pp. 49-57, 1987. T. Faugl, M. Stokely, B. Wieland, I. Bolotnov, J. Doster, J. Peeples, M. Poorman: WTTC 16 Proc., Prague, Czech Republic, August 18-21, 2014. E. O’Brien, M.H. Stokely, J.M. Doster, I.A. Bolotnov: ANS Proc., Washington D.C., US, November 8-12, 2015. K. Gagnon, M. Jensen, H. Thisgaard, T.J. Ruth: Appl. Radiat. Isot. 69(1), pp. 247-53, Sept. 2010. F. Tárkányi, S. Takács, S.-J. Heselius, O. Solin, J. Bergman: Nucl. Instr. Meth. Phys. Res. A 397, pp. 119-124, 1997. S.-J. Heselius, P. Lindblom, O. Solin: Int. J. Appl. Radiat. Isot. 33, pp. 653-659, 1982.